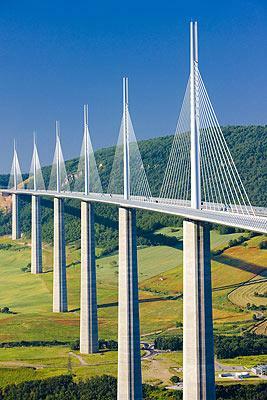 Millau Bridge (officially Millau Viaduct) is a road-bridge spanning the valley of the River Tarn near Millau in southern France. It was designed by the renowned 'modern architect' Norman Foster, working with French engineer Michel Virlogeux. The bridge was opened to traffic on 16 December 2004 to immediate fame and acclaim. 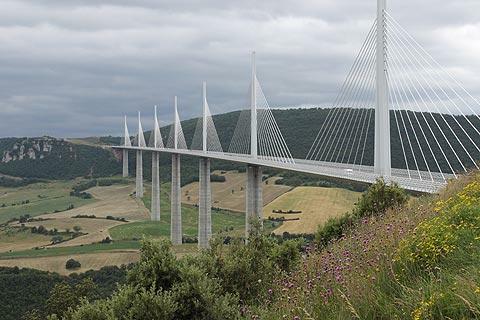 Among other remarkable features it is the tallest vehicle bridge in the world. The highest pier has a height falling between that of the Eiffel Tower and the Empire State Building. 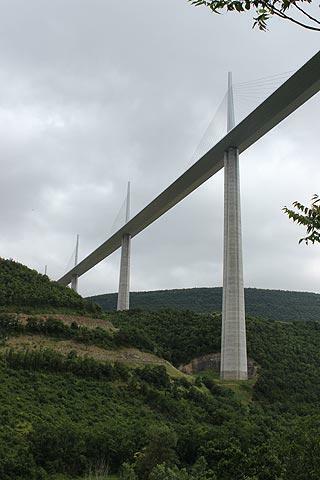 The viaduct is nearly twice as tall as the previous tallest vehicle bridge in Europe, the Europabrücke in Austria. 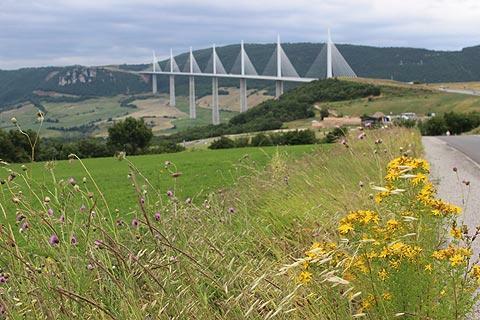 Millau Viaduct is located near the town of Millau in Languedoc-Roussillon. The bridge was built to relieve heavy congestion on the roads during the summer holiday season - it is the last section of the A75 motorway that leads to the Mediterranean coastal resorts. 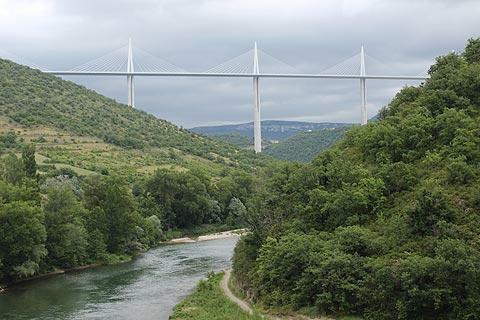 The Millau bridge falls inside the Grands Causses regional natural park. In addition to being a major improvement to the road system in the region, the bridge has also received critical acclaim and become an immediate tourist attraction in its own right. 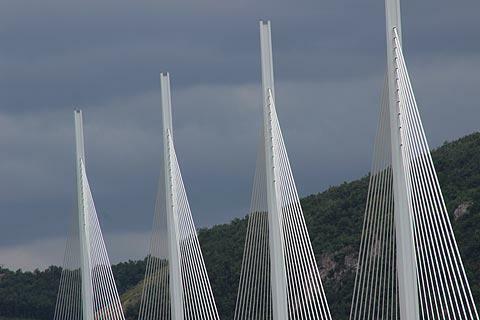 There are a number of options available for a visit to Millau bridge. Crossing it in your car is of course an option, but not worth doing unless your journey warrants it. You don’t get much of a view because of the barriers and you are not allowed to stop on the bridge. You can have an easy ride to the bridge by parking in the town centre and taking the tourist bus from Millau Tourist Information Office. This will enable you to get the best possible views, photo opportunities and of course a running commentary on the construction from infancy to completion. You can also visit the official information site underneath the bridge where there is a little museum with photographs of the build, a film to show the progression of the site and various souvenirs to buy. Another option, our favourite, is to visit the information site on the north side of the bridge, where you can again get a historical perspective of the build, but also take the opportunity to walk up to a viewing point high above the bridge itself where you can get some spectacular photos. Be warned though, there is a long and steep flight of steps to navigate to get up there. There are several other interesting attractions in and around the town: see the Millau guide for several suggestions. In particular we should suggest that you visit the small traditional village of Peyre. 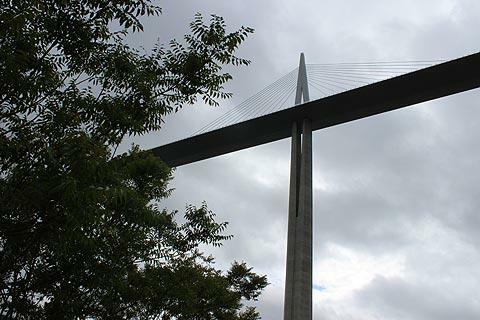 As well as exploring the village you also get an unusual view of Millau bridge from below, quite undiscovered by most visitors.